Adrian Kempe had his first career hat trick to lead the Los Angeles Kings to a 5-1 victory over the Montreal Canadiens on Wednesday. Michael Cammalleri scored the other two goals for the Kings, who have opened their season with their best six-game start (5-0-1) in franchise history. Montreal (1-5-1) still hasn't won in regulation this season. Jonathan Quick made 36 saves for the Kings. The 21-year-old Kempe scored the go-ahead goal on a 2-on-1 breakaway for the Kings at 7:34 in the third period. He scored again at 16:42 and added another at 18:24 as hats were thrown onto the ice. The game was tied heading into the third period before the Kings scored four times. Paul Byron scored his first goal of the season midway through the first period, capitalizing on Derek Forbort's turnover, to give the Canadiens a 1-0 lead. On his first goal, Cammalleri batted the puck out of the air to score on a power play and tie the game at 1 in the first period. It was Cammalleri's first goal of the season and first goal as a King since 2008. The 35-year-old Cammalleri is in his second stint with the Kings. He scored the second goal midway through the third period. Al Montoya made his first start of the season in goal for the Canadiens. Montoya relieved Carey Price on Oct. 7 and played 40 minutes but that was his only work of the season prior to Wednesday. Alex Galchenyuk started on Montreal's top line with Max Pacioretty and Jonathan Drouin. He was called for two penalties in the first period, an illegal check to the head and slashing. The latter led to the Kings' power-play goal by Cammalleri. The Canadiens last won on Oct. 5 in overtime. 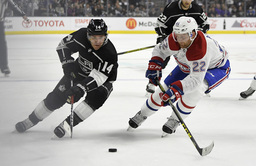 Jeff Carter sustained a lower-body injury after a collision near the end of the first period and didn't return ... Canadiens defenseman David Schlemko had surgery Wednesday to remove a bone fragment in his right wrist and is expected to miss 3-4 weeks ... Right winger Justin Augler, 23, made his NHL debut for the Kings on Wednesday ... "It was Hockey Fights Cancer Night" in Los Angeles and the Kings auctioned their purple jerseys used in warmups online to benefit the cause ... It was also "Ontario Reign Night," the American League Hockey franchise of the Kings. Reign players were in attendance and shown on the JumboTron. Canadiens: Finish their three-game roadtrip by playing the Ducks Friday in Anaheim. Kings: Head out on their longest roadtrip of the season, a six-game, 11-day trek that starts Saturday in Columbus and ends in St. Louis.